1719 Carte De La Nouvelle France - the Vintage Map Shop, Inc. This is a Vintage Map reproduction of a map of North America with an insert of the Mississippi River Delta and the Gulf Coast. The map was originally published in Amsterdam by Henri Abraham Chatelain, circa 1719. This one sheet map showing an early 18th century North America was derived from a number of previous sources and earlier large format maps. 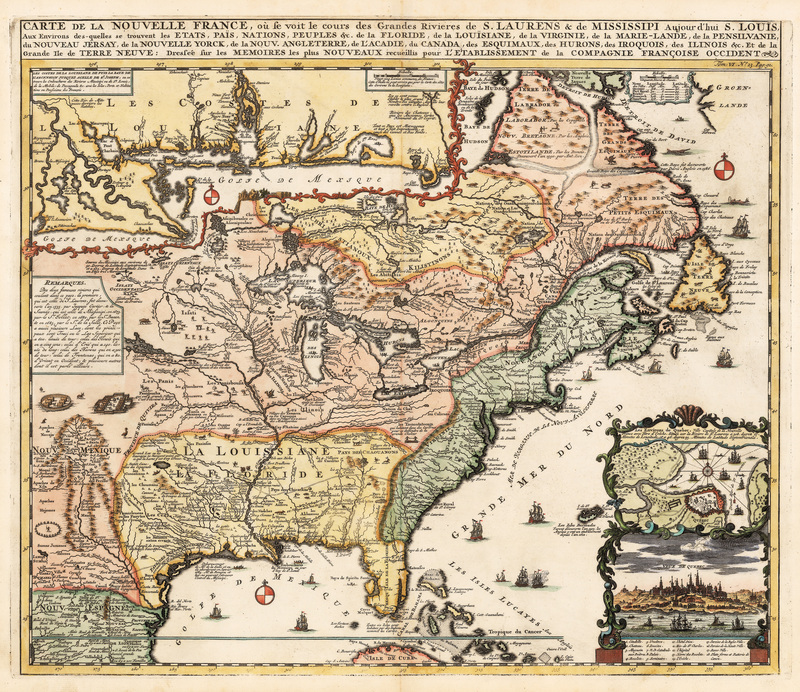 The majority of the map is based on De Fer’s groundbreaking 4 sheet map of 1718, showing the inhabited parts of North America. The insert of the Mississippi Delta to Fort Charle Ruine in present day Florida is based upon the 1699 voyage and discoveries of Pierre Le Moyne d'Iberville. D’Iberville’s exploration also contributed to the information shown from the mouth of the Mississippi to the Red River in Arkansas and many of the tributaries in between. The map was issued to promote the recently established 'Compagnie Francoise Occident', which was formed to fund the debt of Louix XIV and offered inducements to encourage settlement in Louisiana. The result of which is best remembered as John Law and the Mississippi Bubble in which a speculative frenzy ended in financial collapse. The map is filled with wildlife, scenes of Indians hunting; Indian villages and notations, and the oceans are embellished with numerous ships, canoes and sea monsters. Inset plan and view of Quebec, the French Canadian capital, is enclosed in a very decorative cartouche.